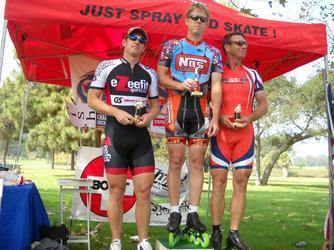 Parkinson's Open Road Race at EL Dorado Park, Long Beach ,CA. Photos have been posted on separate pages, check the index on the left to see them! Carlos leading the pack, love the race faces on everybody's face! 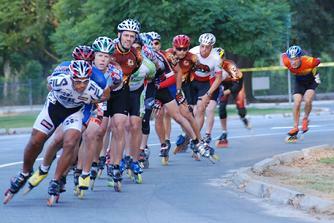 A word about our team skin suit design, color combination and the skaters who designed it. Our skin suits were a combination of our teammates ideas. Once we all agreed upon all the colors logo placements and sizes etc, we sent in our design diagram and color requests to Pyro Apparel of Cleveland Ohio. With thanks to Allan for sewing us some great suits, we are very happy with your work and the results. And highly recommend him for your inline skate suit needs! Our skin suit design and logos are exclusive property of myself (Audrey) and (Beach Bladers Inline Skate Team) and as such is protected under applicable copyright law. Any access to artwork/design provided is granted for the limited use of preparing and providing quotes for making of potential skins suit for our skating team or to produce any of our team clothes for use by Beach Blader Inline Skate team only, and may not be reproduced, copied, or posted on any other site or used for any other purpose(s) without express written consent of the team captain (Audrey) Thank you for your understanding.